From a small temporary bar in Porto, to a Pedestrian Escalator in Montemor-o-Velho and a large Arts Centre near Chaves, the featured projects in our report of the most recent architectural undertakings in Portugal vary as much in scale as in agenda. Projects like a small church in Pedras Salgadas, a discreet but charming cultural centre in a traditional praça in Lisbon, and a spiritual hotel in Penafiel, add to the kind of exciting smaller-scale operations taking place throughout the country. On the other hand, Lisbon's Future Architecture Thinking (FAT) and New York architect Louise Braverman's Arts Centres, as well as Byrne and Souto de Moura's cultural undertakings are amongst the larger projects - mainly in the cultural field - that were recently completed in Portugal. Many of these works deal with delicate issues, such as the restoration of fragile urban fabric and heritage buildings threatened by ruin and decay. Alternatively, many of the more temporary interventions are more concerned with ideas and ventures responding to the country's current status. Portugal may be well known for its enviable weather conditions and beautiful natural and urban surroundings, but it is also conditioned by current political and economic tensions. This highlights even further the energetic and creative way local architects engage with the country's ongoing debates around its built environment. The new Art Centre dedicated to renowned Portuguese artist Nadir Afonso is slotted into a hillside. Preserving the rocky walls where the site was sliced off, New York architect Louise Braverman has created a dialogue between landscape and building, and rural and urban. Intended to drive economic, cultural, and community development in the region, the Centre is organised in two distinct but connected volumes - housing exhibition spaces, a children's library, café/restaurant, and auditorium. 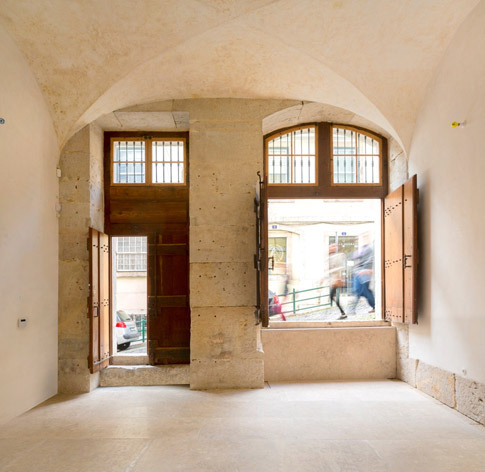 Álvaro Siza Vieira was enlisted to convert this XVIIth century warehouse – located on a narrow street in central Lisbon - into a museum and studio dedicated to the acclaimed Portuguese artist Júlio Pomar. The architect's intervention in the existing structure is discrete: he opted to retain much of the original building, including its facade, while cleaning up the surrounding spaces and adding vertical access to one side of the structure. He also reworked its interiors to accommodate a new public program. The heart of the museum consists of a large, open plan, double-height exhibition and work space, around which are the artist's studio, office, storage and service rooms. The project is yet another addition to Siza Vieira's ever expanding body of work - maintaining his position as one of the most important Portuguese architects in the last decades. 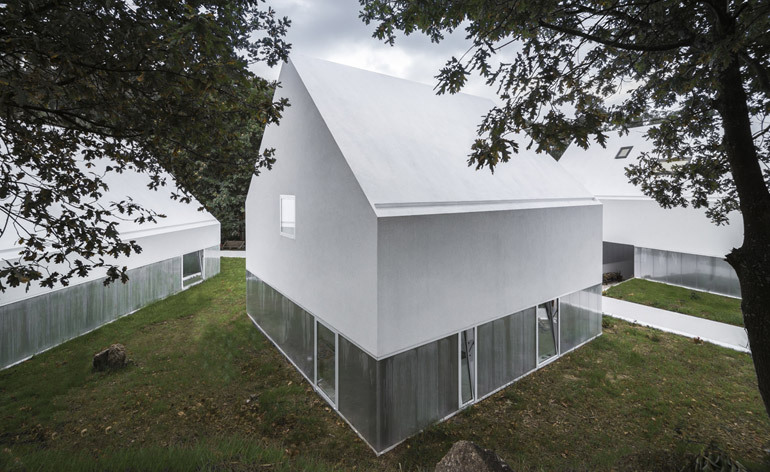 Set in the rural landscape of Penafiel, in the wine region of Douro, the White Wolf Hotel consists of a series of white-coloured houses immersed in their surroundings. Porto architects AND-RÉ were faced with a brief that set the project apart from other conventional touristic ventures: to create a hotel where guests could reconnect both spiritually and physically with nature. AND-RÉ's response to this assignment was to create a group of houses that appear to float above the landscape. 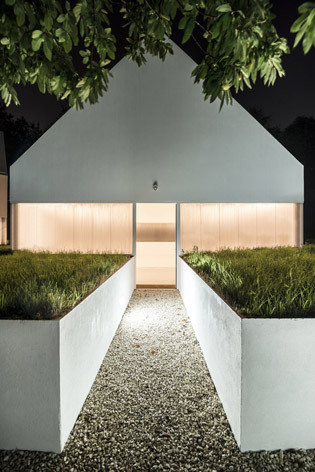 Each house has a bright and open ground level, contrasted with a more enclosed and intimate upper level. The pathways between the buildings have been sunk into the ground. In the past couple of years, Portugal has experienced its largest wave of emigration since 1966. 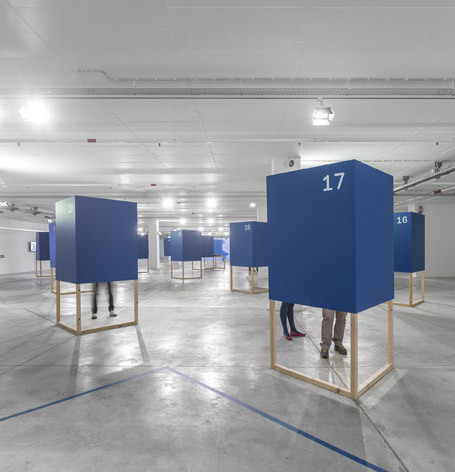 Tanto Mar - 'Portuguese people outside of Portugal' - is currently on show at the Cultural Centre of Belém, just a few minutes' drive from Lisbon along the Tagus River. Curated by multi-disciplinary architects Ateliermob, the exhibition disseminates works that have been created by those who have left the country. Showcasing projects related to the built environment, it is presented in purpose-built timber structures that are organised in a grid plan according to their content. This Multipurpose Pavilion in Viana do Castelo, designed by Pritzker-Prize winning architect Eduardo Souto de Moura, is a space dedicated to cultural and sport events. Its interiors are ample and permeable, offering sea view options from the entrance floor. Approaching the site from the north, a square planted with trees marks the entrance to the Pavilion. The building is a simple rectangular volume, an aluminium box containing all the necessary services for the functions of the different activities promoted in its interior. The design is inspired by naval architecture and in particular by the Gil Eanes ship, named after the Portuguese navigator and explorer. The Mesh pavilion is the 2014 Porto Architecture Faculty's contribution to the annual Queima das fitas (or 'burning of the university ribbons') student festival. The temporary bar was designed by Fala Atelier, whose main concern was to create a 'light box' that would stand out from its surroundings and act as a point of reference for the crowds. Using their creativity to make the most out of a €500 budget, the architects built a 3 x 3 x 5m frame, and used a chicken wire mesh over plastic panels to create a 'smooth cloud'. With the Lousã Mountains as its backdrop, the House of the Arts stands out both in its shape and colour, providing the village of Miranda do Corvo with an important new public space. Future Architecture Thinking (FAT) designed a building that echoes mountain slopes and the village's roofscape. The continuity between its red walls and roof emphasizes the building's dynamism, and suggests versatile interior public spaces destined for culture and creativity. Read more about the project. In 1998, renowned Portuguese architect Gonçalo Byrne won the competition to refurbish and create an extension to one of the country's most important National Museums. Open since 1910 and spread out like a 'historical campus', the museum features an important art and architecture collection and its buildings incorporate elements from the Romantic, Renaissance, and Baroque eras. 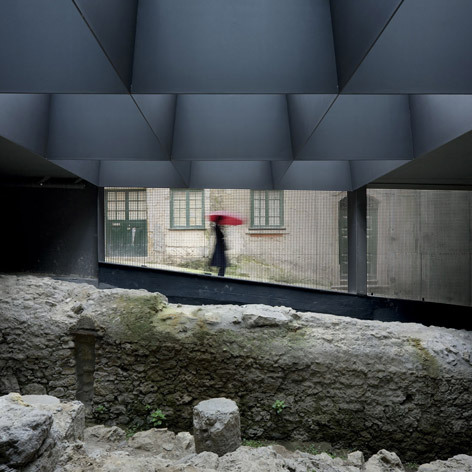 In this delicate site the architect intervened incrementally in building a new structure dedicated to the exhibition of historical pieces of art, and created a promenade through the different layers of history - inviting its visitors to remember and celebrate Portuguese heritage. He also enhanced the Museum's presence within the city by improving key access and view points. Located in Severa square, in the traditional neighbourhood of Mouraria in Lisbon, this Cultural Centre is housed in what used to be a derelict building. 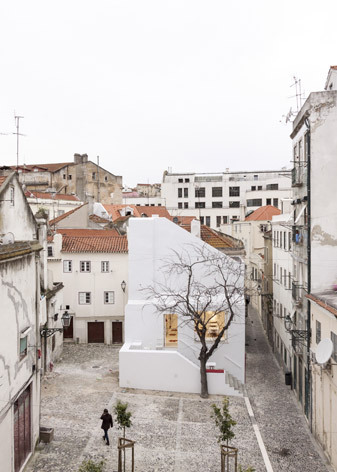 Assigned to renovate the structure to accommodate a new public agenda, Lisbon-based José Adrião Arquitectos decided to hollow its interior and preserve its exterior - which is an important presence in the urban fabric of the area. Casa da Severa features a café/restaurant that can be accessed directly from the square by a staircase, which acts as a continuation of the public sphere. The House hosts a lively program dedicated entirely to the traditional Portuguese music of Fado. Located in downtown Porto, this small but stylish bar takes its name from its eccentric golden tunnel, featuring a ceiling of floating, colour-changing arches that suggest a contemporary installation. Inspired by Andy Warhol's Factory, and Anish Kapoor and Olafur Eliasson's installations, architect José Carlos Cruz designed the bar as a long, narrow corridor, which adds to the city's vibrant nightlife. 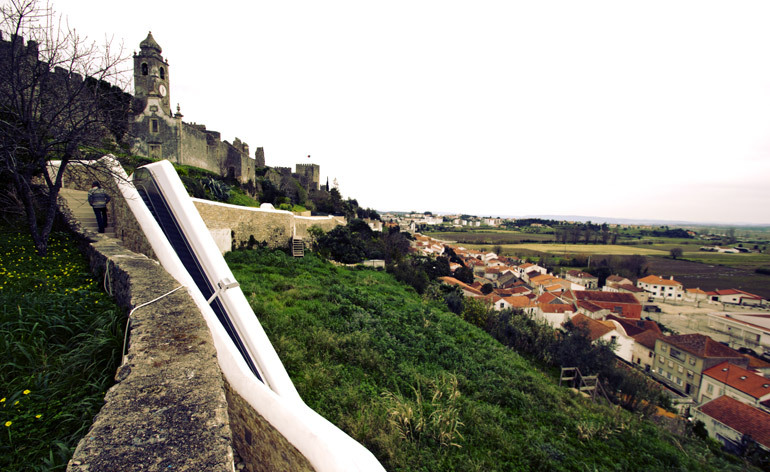 This Assisted Pedestrian Path, designed by Architect Miguel Figueira, links the town of Montemor-o-Velho to its Castle, 30 metres up the hill. As well as adding to the social and urban fabric of the town, especially in this relatively neglected southern slope of the Mondego Valley, these three escalators and stairs are part of an attempt to reconnect the town with one of its most important historical heritages. Calling it an 'urban machine', there to revive the local urban tissue, the architect did a meticulous job of inserting the escalators into the slope's topography. Architecture offices don't often have much of a street presence, however, Pedro Pacheco's new office in Lisbon's Baixa neighbourhood will engage in a unique dialogue with its street, Calçada do Correio Velho. The architect was careful to preserve the most significant sections of this ground level space, located in a building dated from XVIIIth century, while giving it a contemporary update. The atelier contrasts existing vaults and old stone, with white washed walls and other new touches that bring it into the 21st Century. Rebelo de Andrade architects refurbished this XIXth century Pombalino-style building, located in the traditional neighbourhood of São Paulo in Lisbon, into a stylish 'short-stay' apartment block. To keep costs down, the architects made very discreet but significant interventions - one of the most notable ones being the exterior façade's replacement with dark red, shiny traditional Portuguese tiles. Lisbon-based architects Rebelo de Andrade were commissioned to refurbish this old historic church, which was initially presented to them in ruins. Restoring its original exterior envelope, the architects renovated the interior of this small religious building and reorganised the altar and praying spaces, contrasting their modern timber furnishings with plain white curved walls and ceiling. The project is part of a plan to regenerate the 20-hectare Pedras Salgadas Park, which includes the refurbishment of an old Casino, the Tree Snake House Hotel, and the Eco-Resort and Spa. The DM2 project consists of the refurbishment and transformation of a neglected historic building in Porto’s centre into 17 housing units for students and other young people. Porto-based Ooda Architects combined contemporary fixtures with classic elements. Incorporating playful patterns in the façade and pavements, contrasted with sober interior surfaces, these apartments add to a spate of regeneration projects in inner areas of the city.